Although we didn't head to Newton (which the kids wanted and which we had been doing the past couple of years) we still had a great Halloween! Both kids got to wear their costumes to school and then Angela had a party afterward. Since poor Angela (as second child) doesn't get many things for just her we all made sure to make it to her party. Is there anything cuter than seeing a bunch of little kids smothered in costumes that are huge on them? Adorable! She showed off her classroom and the buggies they use for walks. We were excited to get to celebrate our friend Vivian's 5th birthday with her. It was absolutely hysterical because Mary Beth planned the party at this super old bowling alley in Eastie. It was hysterical with a lot of "character". The kids just tore up the place. She even brought in a face painter that both of my kids finally like. You can see Richie the pirate (his new favorite thing) and Angela's first bee. It didn't hurt that we started our trip to East Boston with Santarpio's. YUM!! Since Rich (and Angela these days) love hockey so much we have been taking them to some Clarkson games. This game was hysterical because Bentley is not a D1 team and they don't even have their own arena! Instead the game was at a DCR rink in Watertown! Seemed more like a high school game than anything, but the kids had fun. And a Friday night out with Buff's wings for dinner....perfect. Rich has decided he wants a Clarkson t-shirt for Christmas so he must like it. Angela just yells Go Bruins, but she had trouble going from cheering for the Red Sox to the Bruins as well. Glad our buddies Lisa and Doug could join us. We are truly missing Dawn, but luckily she misses us too! Because of this we still see her at least once a week. She watched Angela so that I could chaperone Rich's field trip. While I was gone they made tofu stir fry for all of us for lunch. Yum and thanks! Richie had a school field trip called the Harvest Walk where the kids had to dress up as their favorite book character. What a great idea except that the creativity skills between Chris and I are next to zero! Rich's favorite book is actually Dino Hockey so we thought we could pull that one off (a dino tail and a hockey jersey, pretty easy right?). Well when it came time to make this costume Rich said his favorite book was If You Give A Cat A Cupcake and he wanted to be a cat. HUH???? Well we pick our battles wisely around here and this was not one I wanted to fight. I figured it was best to have Rich on board and make the costume he wanted, rather than fight with him about it. OK, so now how do you make a cat? You can see the mask, belly and tail we came up with below. One ear fell off before the end of the morning, but otherwise he was very happy. You have to make a Jack O Lantern every year around Halloween, right? Well I actually don't like this task, but love watching Chris and the kids do it! You can ask Chris if he likes it or if I just make him do it (because he is SO good at it!). Regardless the kids love it of course so we do it. This year Richie wanted it to be scary, but Angela said no funny. I think Chris did a good job compromising. Jack only lasted about 3 days, but we loved him while he was around. I remember the days when Rich would scream during this process....sad the pumpkin was cut......grossed out by the gooey insides. Now they dig in and pull out the seeds to roast. Another yummy part of Fall. 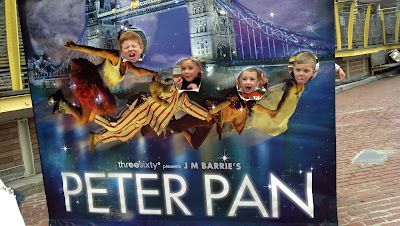 We went to see Peter Pan with a whole bunch of our buddies (Riley, Colton, Sammy and Brayden). The boys had a blast and screamed (and I mean literally screamed) lines from the show (that has Pirates so you can imagine how loud) throughout City Hall Plaza. What could be better than seeing a show that has sword fights with your best buds?......beers with the Mommy friends afterward! A win-win situation. This show was extra amazing because it was the new 360 degree theater. So life like with an amazing set and all of the characters flying through the air right on top of you. This is a must see. Well a must see for kids who aren't afraid (Angela wanted no part) AND Tinker Bell uses a few choice words that little kids are NOT allowed to use. It went over Rich's head, but it didn't get past the bigger boys. Naughty Tink! Our annual trip to the zoo for Halloween. I always think it is silly to spend so much time picking out a costume and then only wear it one time. SO, we like to extend our celebrating! We trick or treated with the animals and our friends Maggie and Logan Tilden. We also danced with Radio Disney. Notice Angela is a mouse. She BETTER be a monkey for Halloween (her real costume) or I will be the one who has the meltdown. Angela wanted to be a monkey and has been SUPER happy with her choice for weeks......until the second we are walking out the door and she says, NO mouse. I may have to hide that costume because as you can see, it is too small. KIDS! See our Batman, mouse, Raggedy Ann and bee! Another amazing North End event.....TOUCHING the Stanley Cup! Yes, as a thank you to the North End residents, we had a viewing of the cup. The kids were SO excited and I think now Richie can sleep at ease. He has been sort of upset since the day we saw the Stanley Cup in the parade because I got to touch it and he didn't. Well now he has too. My kids are ridiculously lucky!!! The line was so short that we actually went and touched it 3 times. Rich said it felt like cold glass. We also have a family picture with it that I am waiting to be uploaded to the Bruins site. Maybe our Christmas card for this year??? 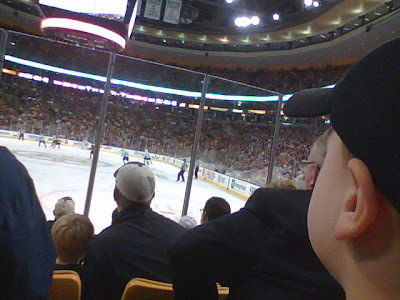 Well another reason my kids are SUPER spoiled.....6th row tickets to the Bruins game! There were no other kids their age in these amazing seats. The pictures came out bad (I HAVE to take my real camera next time), but you can certainly see how close we were. Angela was cheering and yelling along with everyone. She had a blast and got a pink hockey stick as a prize. It is cute, but we now own 30 hockey sticks! Rich wouldn't leave his seat between periods because that is when the little kids play (called 3 minutes of fame) and the zamboni. Suffolk University has teamed up with the Eliot School (Richie's new school) to help raise the funds necessary for the students to have the best learning experience. One of their fundraisers was the Suffolk Stampede. It was a 1.4 mile walk or 2.4 mile run along the Esplanade. We could not have asked for a better day and Richie has been dying to do another race so this was our perfect weekend activity. Chris and Angela walked/strollered most of the way, but Richie and I RAN! OK, so we had a few breaks, but not that many for a four year old. I love that he loves to run. As I have always said, he loves ALL sports. You can see Rich with his teacher Ms. Simonini below along with Team Wells. Needed apples and a carving pumpkin so we headed to Russell Orchards in Ipswich straight from soccer. We went to Russell last year and knew it was really laid back and not super crowded. PLUS they have animals, cider and cider donuts. 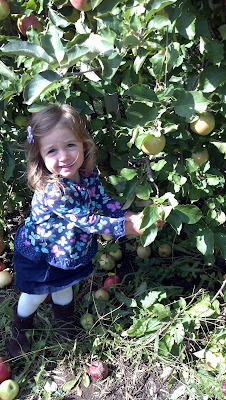 The real reason apple picking is one of my favorite activities. And as soon as we got home we made an apple pie. Another yum! As you can see Richie has really improved at soccer! He was a bit timid before, but he now gets right up in there. A couple of these kids are really good so the kids have a lot of fun really playing and not just picking weeds.